Don't worry this is not going to become a cooking blog. I just wanted to share this story. My spouse and I were watching an old Tracy/Hepburn film called "Desk Set", which I was pretty terrible honestly, not the least because nobody involved with the film knew how an actual computer worked. We were intrigued -- what was this dessert -- and while their impromptu supper descended into men beating chests and Katharine brilliantly looking completely disgusted, I googled. 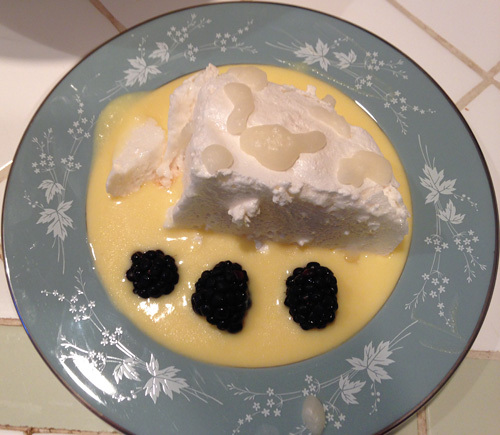 I ended up with this recipe, and two hours later, I had Floating Islands, sans caramel sauce. This month I am doing Flora's Creative Revolution Challenge and this fit in perfectly as a response to the prompt of Food Art. The interesting thing about this challenge is that it is in no particular order, I get to choose. This opens me up to all the potential possibilities. I had problems with this recipe, derived from a Julia Child's one. I could not get the sugar to caramelize for love or money. And I even started over and tried it again. 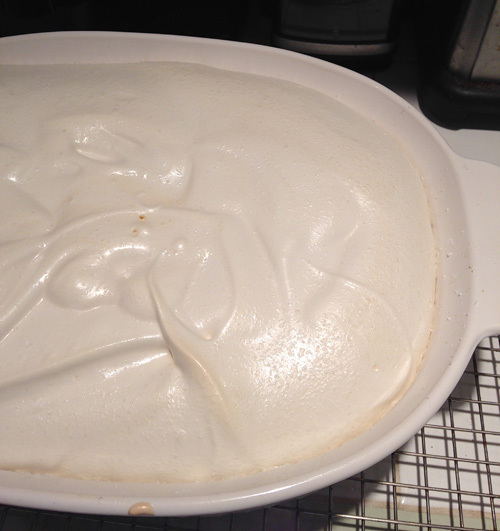 The island, which is soft (not crunchy) meringue, also took some fast fixing. The amount of egg white was one and two-thirds cups or "about 12 eggs". I rolled with the 12 eggs, not thinking to measure. Oops. My egg whites foamed but no peaks. I put in the required amount of sugar (it said granulated and I used the finer Baker's sugar which is what I use to make meringue) and beat and beat and no peaks at all, let alone shiny stiff ones. 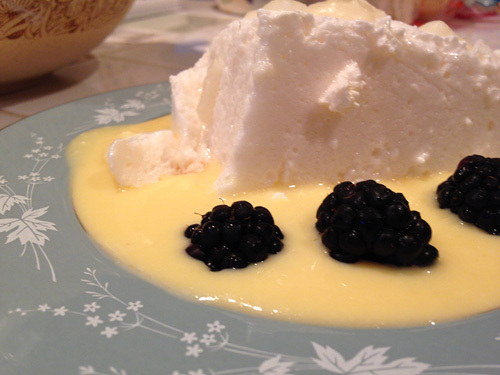 Fortunately, I've made Pavlova for many years and so kept adding sugar and beating and beating until I got meringue ready waves. "You must be careful not to overheat it and scramble the yolks, but you must have the courage to heat it enough so that it thickens." There was a moment when I realized it was starting to feel like scrambled eggs and I quickly took it off the heat. However it turned out deliciously, especially with the "optional" butter and rum. Would I make again? Absolutely. I will have to see Julia's original recipe to check on the caramel sauce, and, of course, remember to measure.